This is the unit with a few sample lines done on glass. The tip is .5mm but the lines spread out as I had to thin the paint, an old can of thick enamel! - if thinning the paint it takes a fair bit of testing to get it right and best to test on a sample card of the paint your going to line. I'm a bit rusty at doing lining and this was the third attempt for posting this thread, more practice is required- speed is the key, a constant speed, when you have the paint right! 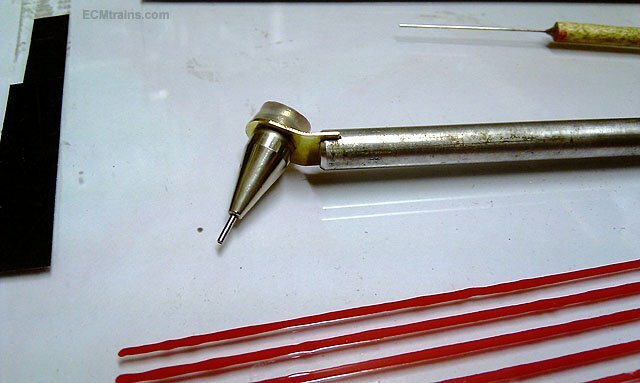 The components- .5mm tip, scrap brass to hold the tips, silicone tube off cut to clamp the tip in the brass holder, 6mm aluminium bar handle with slot to take the brass, and a .45mm NS wire prodder to clean the tip. And yes you probably guessed it- the tip is from a Faber Castell mechanical pencil 'Contura' range- for about €10.00 which comes in .3mm, .5mm, and 1mm lead sizes. I do have a .3mm pencil but could not locate it for this posting, I also have an adapter that allows the lining pen to follow edges and the like , and it's adjustable, but again a problem locating it. I also recently bought .2mm dia NS tube to make a .2mm tip- I will post a photo when made and hopefully I'll find the other parts by then? You've made your own R L Moore lining pen, Eoin! Will post a picture of mine, later. Have been experimenting with acrylics in the bow pen, to reasonable effect. Ian Rathbone's book contains a wealth of dodges, not least how to correct mistakes. With acrylics, a cocktail stick and a fine brush can work wonders!